Acon (1.06.2015) - Postal vehicles. Machine 00001. Mint ATM, domestic postage (NIS 2.20). Acon (1.06.2015) - Postal vehicles - Inbar. Machine 00001. 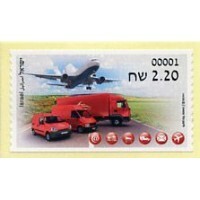 Pictorial first day cover, domestic postage (NIS 2.20). Acon (1.06.2015) - Postal vehicles - Inbar. Machine 00001. First day cover, to Spain (NIS 7.40). Acon (1.06.2015) - Postal vehicles - Inbar. Machine 00001. Mint button set 6 values (NIS 2.20 - 4.10 - 6.50 - 7.40 - 8.30 - 9.00). Acon (1.06.2015) - Postal vehicles. Machine 00101. Mint ATM, domestic postage (NIS 2.20). Acon (1.06.2015) - Postal vehicles - Inbar. Machine 00101. Mint button set 6 values (NIS 2.20 - 4.10 - 6.50 - 7.40 - 8.30 - 9.00). Acon (1.06.2015) - Postal vehicles. Machine 00220. Mint ATM, domestic postage (NIS 2.20). Acon (1.06.2015) - Postal vehicles. Machine 00220. Illustrated first day cover in the post office (NIS 2.20). Acon (1.06.2015) - Postal vehicles - Inbar. Machine 00220. Mint button set 6 values (NIS 2.20 - 4.10 - 6.50 - 7.40 - 8.30 - 9.00). Acon (1.06.2015) - Postal vehicles. Machine 00300. Mint ATM, domestic postage (NIS 2.20). Acon (1.06.2015) - Postal vehicles. Machine 00300. Illustrated first day cover in the post office (NIS 2.20). Acon (1.06.2015) - Postal vehicles - Inbar. Machine 00300. Mint button set 6 values (NIS 2.20 - 4.10 - 6.50 - 7.40 - 8.30 - 9.00). Acon (1.06.2015) - Postal vehicles. Machine 00326. Mint ATM, domestic postage (NIS 2.20). Acon (1.06.2015) - Postal vehicles - Inbar. Machine 00326. Mint button set 6 values (NIS 2.20 - 4.10 - 6.50 - 7.40 - 8.30 - 9.00). Acon (1.06.2015) - Postal vehicles. Machine 00450. Mint ATM, domestic postage (NIS 2.20). Acon (1.06.2015) - Postal vehicles. Machine 00450. Illustrated first day cover in the post office (NIS 2.20). Acon (1.06.2015) - Postal vehicles - Inbar. Machine 00450. Mint button set 6 values (NIS 2.20 - 4.10 - 6.50 - 7.40 - 8.30 - 9.00). Acon (1.06.2015) - Postal vehicles. Machine 00636. Mint ATM, domestic postage (NIS 2.20). Acon (1.06.2015) - Postal vehicles. Machine 00636. Illustrated first day cover in the post office (NIS 2.20). Acon (1.06.2015) - Postal vehicles - Inbar. Machine 00636. Mint button set 6 values (NIS 2.20 - 4.10 - 6.50 - 7.40 - 8.30 - 9.00). Acon (1.06.2015) - Postal vehicles. Machine 00714. Mint ATM, domestic postage (NIS 2.20). Acon (1.06.2015) - Postal vehicles. Machine 00714. Illustrated first day cover in the post office (NIS 2.20). Acon (1.06.2015) - Postal vehicles - Inbar. Machine 00714. Mint button set 6 values (NIS 2.20 - 4.10 - 6.50 - 7.40 - 8.30 - 9.00). Acon (1.06.2015) - Postal vehicles. Machine 00900. Mint ATM, domestic postage (NIS 2.20). Acon (1.06.2015) - Postal vehicles. Machine 00900. Illustrated first day cover in the post office (NIS 2.20).